Solving a decades-old mystery, an international team of astronomers have discovered an extremely hot magnetosphere around a white dwarf, a remnant of a star like our Sun. The work was led by Dr Nicole Reindl, Research Fellow of the Royal Commission 1851, based at the University of Leicester, and is published today (7 November) in the journal Monthly Notices of the Royal Astronomical Society. White dwarfs are the final stage in the lives of stars like our Sun. At the end of their lives, these stars eject their outer atmospheres, leaving behind a hot, compact and dense core that cools over billions of years. The temperature on their surfaces is typically around 100,000 degrees Celsius (in comparison the surface of the Sun is 5500 degrees). Some white dwarfs though challenge scientists, as they show evidence for highly ionised metals. In astronomy ‘metals’ describe every element heavier than helium, and high ionisation here means that all but one of the outer electrons usually in their atoms have been stripped away. That process needs a temperature of 1 million degrees Celsius, so far higher than the surface of even the hottest white dwarf stars. Reindl’s team used the 3.5-metre Calar Alto telescope in Spain to discover and observe a white dwarf in the direction of the constellation of Triangulum, catalogued as GALEXJ014636.8+323615, located 1200 light years from the Sun. Analysing the light from the white dwarf with a technique known as spectroscopy, where the light is dispersed into its constituent colours, revealed the signatures of highly ionised metals. Intriguingly these varied over a period of six hours — the same time it takes for the white dwarf to rotate. 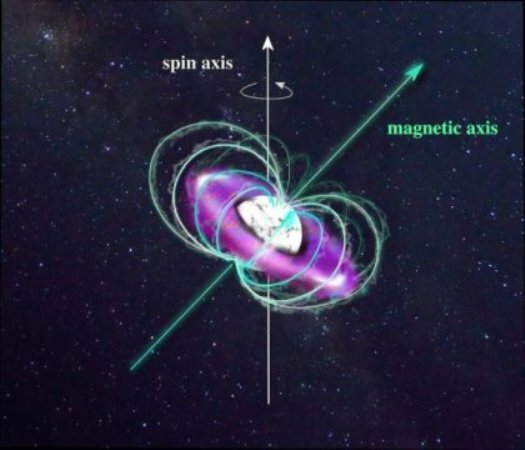 Reindl and her team conclude that the magnetic field around the star — the magnetosphere — traps material flowing from its surface. Shocks within the magnetosphere heat the material dramatically, stripping almost all the electrons from the metal atoms. “It’s like a doughnut made up of ultra-hot material that surrounds the already very hot star” explains Reindl. “The axis of the magnetic field of the white dwarf is tilted from its rotational axis. This means that the amount of shock-heated material we see varies as the star rotates. It may be that a quarter of white dwarfs go through a stage of trapping and super-heating material. Reindl and her team now plan to model them in detail and to extend their research by studying more of these fascinating objects.